What Are The Health Benefits Of Juniper Berries? The juniper berry plant is a small evergreen (coniferous) plant mostly found naturally in parts of Europe and North America; though, it has a wide distribution north of the equator. The juniper berry plant (Juniperus communis) is a small evergreen (coniferous) plant mostly found naturally in parts of Europe and North America; though, it has a wide distribution north of the equator. 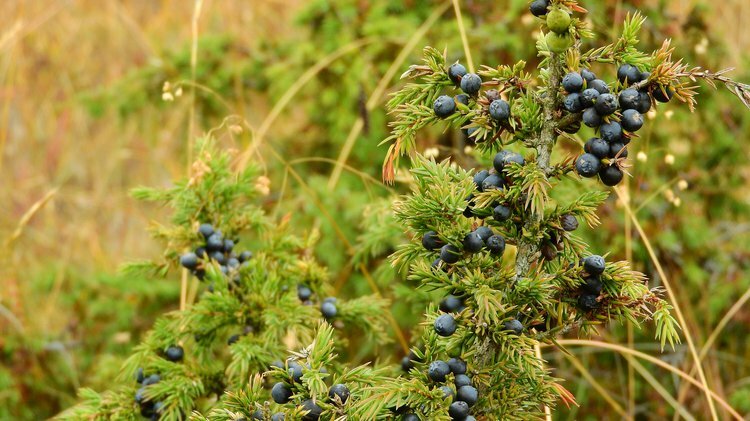 The bitter-tasting, turpentine-like smelling seed cone of the plant is called the juniper berry, and it is not a fruit. Juniper berries are loaded with minerals and vitamins such as copper, calcium, iron, zinc, limonene, phosphorous, magnesium, chromium, potassium, and selenium, as well as vitamins B (B1, B2, and B3) and C.
They also have a rich content of phytochemicals and essential oils. Juniper berries have been traditionally used in European cuisines to flavor game meat, as part of aromatherapy, and to prepare alcohol, particularly gin. Juniper oil is also known for its wide-ranging medicinal properties, apart from its commercial use in cosmetic products, soaps, etc. The phytochemicals found in juniper berries, such as beta carotene, camphor, and tannins, are helpful in preventing cell damage due to oxygen radicals. These chemicals with antioxidant properties, as per research published in the medical journal Pharmacognosy Research, impede the free radicals of the body from contributing to disease development, including heart diseases, arthritis, and certain cancers, and hence, promote healthy body immunity. The University of Michigan highlights that juniper berries are helpful as a digestive aid, particularly for heartburn and indigestion problems, due to their astringent property. The University of Michigan also informs that juniper is a diuretic, which means it prevents an excess retention of water in the body. It causes an increased urine outflow, thus helping clean the body system of toxins and impurities, which implies that there is a decreased chance of urinary tract infections. Problems of gas and flatulence can also be relieved by using junipers. However, excess consumption of preparations/extracts of juniper berries are not advised for individuals with kidney conditions and women who are pregnant or breastfeeding, per the University of Michigan. Juniper berries have strong anti-inflammatory properties. They can help the body fight against arthritis causing sore joints and pain, by relieving some of the symptoms. Infections caused by pathogens, such as bacteria and fungi, may be treated using juniper berry extracts that contain anti-septic properties. According to the Shiraz University of Medical Sciences researchers, juniper berry chemicals are found to be effective against both gram-negative and gram-positive bacteria. MRSA, which is known to cause many hospital infections, Staphylococcus aureus, and E. coli, are the common bacteria against which juniper berry extracts are thought to be effective. Skin infections and skin conditions, such as athlete’s foot, acne, psoriasis, and dandruff, are also known to be treated with juniper juices. Slow-healing skin wounds may be washed with crushed extracts of juniper berries. National Drugs and Poisons Scheduling Committee Working Party on Essential Oils 1998 Essential Oil Monographs Op. cit. Loizzo, M. R., Tundis, R., Conforti, F., Saab, A. M., Statti, G. A., & Menichini, F. (2007). Comparative chemical composition, antioxidant and hypoglycaemic activities of Juniperus oxycedrus ssp. oxycedrus L. berry and wood oils from Lebanon. Food Chemistry, 105(2), 572-578. Broadhurst, C. L., Polansky, M. M., & Anderson, R. A. (2000). Insulin-like biological activity of culinary and medicinal plant aqueous extracts in vitro.Journal of Agricultural and Food Chemistry, 48(3), 849-852. Veljovic, M., Despotovic, S., Djordjevic, R., Pecic, S., Kalusevic, A., Leskosek-Cukalovic, I., & Nedovic, V. (2011, May). Sensory and antioxidant properties of beer with Juniperus communis L. In 11 International Congress on Engineering and Food. Elmastaş, M., Gülçin, İ., Beydemir, Ş., İrfan Küfrevioğlu, Ö., & Aboul‐Enein, H. Y. (2006). A study on the in vitro antioxidant activity of juniper (Juniperus communis L.) fruit extracts. Analytical letters, 39(1), 47-65.